There’s no shortage of things to see and do in Cologne. The churches of Alstadt are as impressive as many other hotspots in the city. This is a quick overview of the 12 Romanesque Churches in Cologne. The basilica of St Ursula is built on the ruins of an old Roman cemetery and has quite the backstory. Ursula was to marry in Germany and travelled there from her home in England. When she made the journey, she brought 11,000 virgins with her. I hope they got a good discount on group travel. Ursula is now a Saint, although God only knows how. She’s so famous in Cologne that her and her 11,000 virgins are on the city’s coat of arms. Although Ursula married, her virgins were martyred, which doesn’t sound like much fun for them. Their remains are now housed in the Golden Chamber in the church. The Basilica of The Holy Apostles is dedicated to the 12 Apostles. Who’d have thought? Must have taken ages to come up with that name. The church is located at Neumarkt 30. The church is a classic trefoil plan, meaning it has three overlapping rings. This is typical of Christian structures. One of the highlights of the church is its bells. St Apostles has two; the Joseph and the World Youth Day bells. Joseph is the church’s death bell and the latter was cast to mark the 20th celebration of World Youth Day in 2005. The bell is one of the largest in Cologne. The original church of St Gereon dates back to the 11th century and it, like St Kunibert, is a minor basilica. St Gereon has the largest dome built between Hagia Sofia mosque in Istanbul and the Duomo of Florence. German architect, Andreas Dilthey, worked on the interior designs. Dilthey is the brain behind the annual landscape art culture festival in Audresseles. St Andreas, at Komödienstraße 6-8, combines both Romanesque and Gothic architecture. Andrew currently serves as the Patron Saint of my home nation, but in Germany, he’s the Patron Saint of the Brewers of Cologne. I genuinely can’t work out which is the greatest honour. St Andrew’s Church is most famous for being the final resting place of St. Peter the Great. Although it’s been extended over the years, this Basilica was built as a chapel of remembrance. The church, which was designated a minor basilica by Pope Pius XII in 1953, sits in the Southern area of the Old Town. Although it was first built in the 4th Century, today it’s oldest remaining parts date back to the 10th. This church started life as a Benedictine Monastery and is one of the oldest churches in Cologne. The church retains some of its Baroque interiors. This is pretty unusual as similar churches in the area had these elements removed. How these have remained in St Pantaleon’s is anyone’s guess. It’s obviously has a really big security guard for actual centuries. Sitting off the Rhine Promenade, St Maria’s is the smallest of the 12 Romanesque churches in Cologne. It’s also the one closest to the Lindt Chocolate factory, so it smells AMAZING. I jest, of course. The chocolate smell in the church was emanating from my handbag. The frescoes within St Maria’s church depict the Queen of Sheba and her prophecies. Each year, the nativity scene of St Maria’s includes the Queen of Sheba. It might seem like a strange inclusion, but not here. The basilica of St George used to have a baroque roof, but this was destroyed during World War 2. A copper replacement is now in place. Because, without one, it’d been pretty chilly inside, no? Located in the centre of the old town, Great St. Martin’s Church makes up part of the city’s famous skyline. I’m not sure what makes Great St Martin quite so great, but the church was all but destroyed by Allied forces in 1942. More than forty years after the war, the church was finally re-opened in 1985. It’s currently used by a branch of the Monastic Fraternities of Jerusalem. I have no idea what that is, but it definitely sounds like fun. Housed on Kasinostrasse in Old Town, St Maria im Kapitol dates back to the 11th Century. The building’s design is based on the Church of the Nativity in Bethlehem. Gothic crosses are especially prevalent in the Rhineland area of Germany. Since 1956, Museum Schnutgen has occupied most of the space in St Cacilien’s Church. Alexander Schnutgen – a former Catholic Priest – donated his collection of religious artefacts, and these are now on display. There are more than 2,000 pieces at St Cacilien, extending from antiquity to the modern era. Some of the most notable pieces are the Comb of St Heribert and the Harrach Diptych. This was the last of the 12 Romanesque churches constructed in Cologne; consecrated in 1247. The Western Tower collapsed during the allied bombing of World War 2 and the rest of the building suffered extensive damage. Pope John Paul 2 designated the church a minor basilica in 1998. This seems to be a rather popular gesture for the churches in Cologne. And long may it continue. 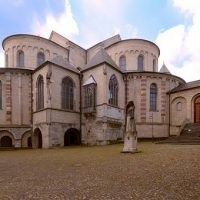 Have you visited any of the 12 Romanesque Churches in Cologne?